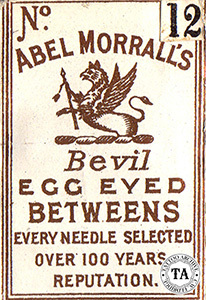 Abel Morrall's is one of the great names in needle making. This company was one of 60 factories located in "the needle capital of the universe" Redditch, England which was about 120 miles north of London. 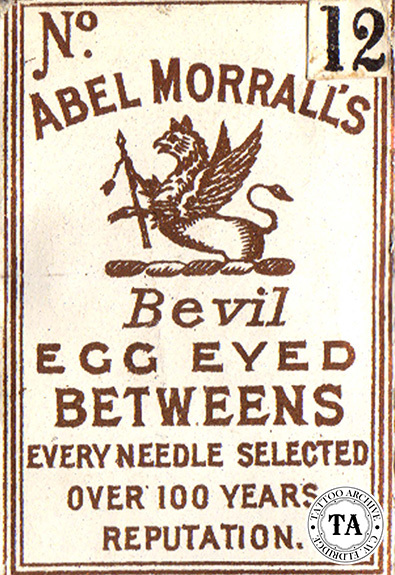 It had produced needles since the late 1700s. At one time these various factories were producing 2.5 million needles a week! Two hundred years later the factories of Redditch still churn out almost 70% of the world's needles. Other band names from this area were R.J. Roberts, H. Milward & Sons, James Smith & Son and S. Thomas & Sons. The quality of English needles have made them a favorite with tattooists around the globe. Sewing (tattooing) needles are made from coils of steel wire. In 1898 one writer listed 22 operations in the manufacturing of a needle. The coils of wire are cut into pieces long enough for two needles and then heated to a dull red and rolled on a flat steel plate to straighten them. The wires are pointed at each end on a grindstone. While they are being ground down to points, they are held in place by a device that turn them as they touch the grindstone, making the points fine and even. Only one end of the piece of wire is pointed at a time. After the ends are pointed the center section of the pieces are stamped by a machine, which makes a flat place for the eye. Next, the two eyes are punched in the middle of each piece of wire by another machine so that each piece of wire becomes a double needle. A piece of wire is now run through the eyes and the needles are cut apart, leaving them hanging on the wire. The eyes are then rounded, smoothed and finally tempered. The needles are then ready to be polished, sorted, and packed for shipping. Needle making is not what it used to be in the tattoo business but I bet that some of the needles that are used in our pre-made ones are from England.